This photo is used under a Creative Commons license by zieak. Alaskans are right there in the front lines of the beer craze, and we have just the event to celebrate the hoppy beverage. Think about it as a two-day-long happy hour, or hoppy hour, if you enjoy a good pun. 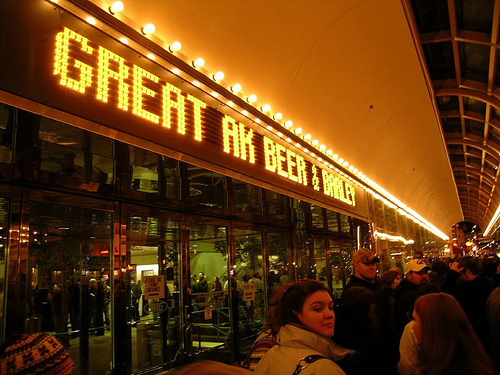 The annual Great Alaska Beer and Barley Wine Festival on Jan. 17-18, 2014, celebrates craft beers at the William A. Egan Civic and Convention Center in downtown Anchorage. Now in its 18th year, the festival, which appropriately falls smack in the middle of Alaska’s 10-day Beer Week, is divided into three sessions, during which more than 75 of the country’s best breweries will sample more than 400 pale ales, stouts, pilsners, porters, specialty brews, barley wines, Belgian ales and more. Guest speakers and live music round out this fun event, popular among Alaskans and visitors alike. This year, back due to popular demand, are performances by the Rabbit Creek Ramblers; Silver Train; Snapping Turtle Swing Band; Rolling Boil Blues Band; Kenny Blackwell and Uptown Blues Band; and, the Rockit Rangers. Can’t make it to Alaska in time for the Beer and Barley Wine festival? That’s okay. To date, the Great North is home to more than 20 breweries. Over the years, these breweries have turned out award-winning beers and put Alaska on the map as a state that take pride in its brew. Connoisseurs can find beers crafted in Sitka, Homer, Seward, Fairbanks, Juneau, Anchorage and many other Alaska locales at local beer and wine shops, big chain liquor stores and a long list of eating establishments and bars throughout the state. Summer months are the perfect time to experience Alaska through its breweries. Long hikes in the great outdoors are best ended with a cold one, as the midnight sun stretches the long day into the wee hours of the night. Be sure to pay a visit to Silver Gulch Brewing and Bottling Company in Fox, a small community just outside of Fairbanks and about a 15-mile drive from the Fairbanks Princess Riverside Lodge. The brewery has four year-round beers and about eight specialty beers, such as the 40 Below Imperial Stout, Epicenter Ale, and Silver Gulch’s Northern Light Light Ale. Head down south to Talkeetna, home to the Mt. McKinley Princess Wilderness Lodge, and kill two birds at once with dinner and a beer at the Denali Brewing Company and Twister Creek Restaurant. Visit the Brewers Guild of Alaska, for a full list of breweries and their location on the map to start planning your trip.